Until the 1950s, markets have been a primary central component of life in NYC. New York was a world-class harbor and a hub for wholesale food supplies for the entire country. New York’s ethnic communities could provide and support sales for specialty fruits and vegetables, and the sheer volume consumed by New Yorkers made markets big business. Markets also established the center for ethnic communities, creating a central area of common interest. Pushcart markets surrounded indoor markets, and grew on the sidewalks in neighborhoods where markets were not yet established, sometimes bettering official markets in price and quality. Although pushcarts crowded already congested sidewalks, most urban neighborhoods depended on them for much of their shopping. 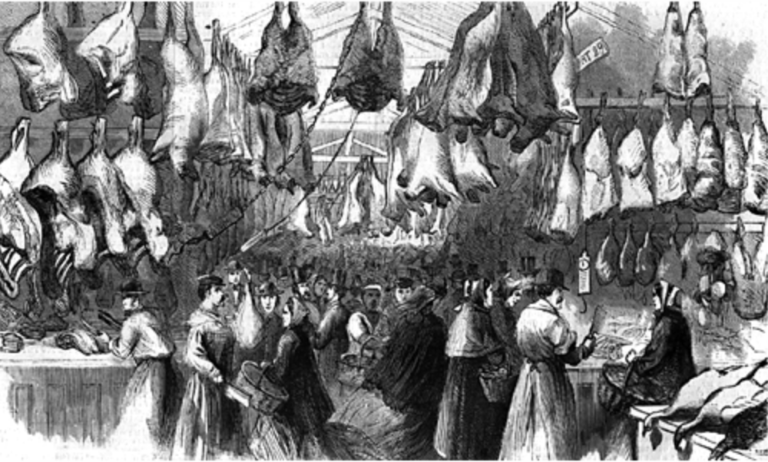 In the early 1880s the city created a farmers’ market, later named the Gansevoort Market and the New West Washington Market, a wholesale poultry market around West St. and 10th Ave. Two major wholesale / retail markets served Brooklyn and Queens: The Jamaica Farmers’ Market, in Jamaica Queens, and the Wallabout Market, which was located in what is now the Brooklyn Navy Yard on the East River. The 1912 Pushcart Commissions recommended establishing wholesale terminal markets for each borough. In 1917 a Department of Markets was created to operate and supervise the city’s wholesale markets: The Bronx Market, Brooklyn’s Wallabout Market, and in Manhattan, the West Washington, Gansevoort Meat and Fulton Fish Markets. By 1923 the pushcarts and peddlers were organized into about 50 open-air markets throughout the city, and by 1933 about 15,000 peddlers were recognized and licensed. Mayor LaGuardia abolished the open-air markets in the 1930’s and used Federal WPA funds to build indoor municipal retail markets, such as the one which remains on Essex Street. LaGuardia banned all pushcarts (except licensed, food-to-eat vendors) in 1938. Disputes between customer and peddler would now be handled by one of the ten on-site supervisors “behind the closed doors of their offices”. Fifteen thousand peddlers lined the streets when LaGuardia took office. By 1941, their eradication was virtually complete. The indoor markets did not flourish. Stall rentals were too high, customers found bodegas and supermarkets more convenient, and refrigeration reduced the need for daily shopping. In 1900, The Washington Market was in its 88th year and was the largest market in North America, stretching about a dozen blocks around Washington, Fulton and Vesey Streets. On the site of what would later become the World Trade Center, hundreds of independent vendors sold fruits, vegetables, specialty foods, wild game and livestock of all kinds. The market was fully renovated in 1915, complete with electricity, gas, hot and cold water, sewer, telephone, and refrigeration. Annual trade for the market was then estimated at $5 million (1915 dollars), and trade to hotels and restaurants alone fed an estimated one million people a day. Burned, moved and rebuilt several times by 1900, the indoor market was torn down permanently in 1957. Inexpensive fresh produce and food stalls were concentrated in the area until it was allocated for development by the Port of Authority of New York in 1962. It closed permanently in 1967 when the Bronx Hunts’ Point Market was established as the distribution site for most of the city’s wholesale produce. The Fulton Market was established as a general market in 1822. As buying and traffic patterns changed, produce and food stalls moved to Hudson St. and the Fulton Market was rebuilt and dedicated to fish vendors. The Fulton Fish Market, still one of the largest in the nation, operates from about midnight to 9am as a major wholesale market for North Atlantic catches. In 2005 the market moved to Hunts Point in the Bronx. It was replaced by the modern Fulton Stall Market. * Largely based on Carol G. Durst, “History of the Food Markets of NYC” published in NY Food Museum’s Newsletters throughout 2002.